Today I’m welcoming Tonya of Sew So Petite to talk about her projects for The Day and Night Dress Challenge. Welcome Tonya!! Hi friends! It’s that time of the year again; The Day to Night Challenge hosted by Elizabeth from Elizabeth Made This. Sound simple right? Not exactly for me. I had my ideas for weeks and when it came time to execute, it didn’t work out for me. So I was left stranded with no ideas. (insert sad face). Have you ever made something that you absolutely knew would turn out great, but ended up in a failure? It takes a toll on your confidence level. But I was able to get myself together, give myself a pep talk and become the boss chick that I know I am. These are my day to night looks. Let’s start with the day look. Let’s talk about it shall we? 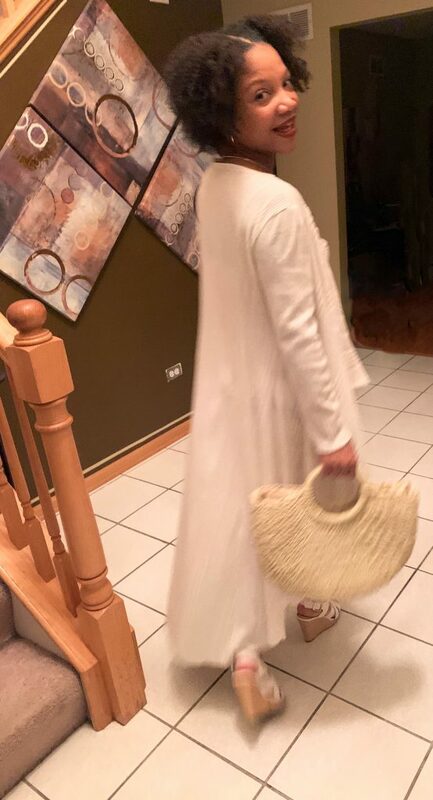 I wanted to go for a very casual, beachy look. I envisioned myself in the Florida Keys, during the day, hanging out. I had this dress in my closet for about 2 years. I’m not much of a dress girl, so finding a dress in my closet that I don’t wear was the easy part. I consider my style to be very classic. I don’t like to wear really bold prints or loud colors. I like a simple, well put together outfit. So for my day look, I was going for the “girl next door” look. I chose Vogue 8772, View C. There were a few things that I changed about the pattern. 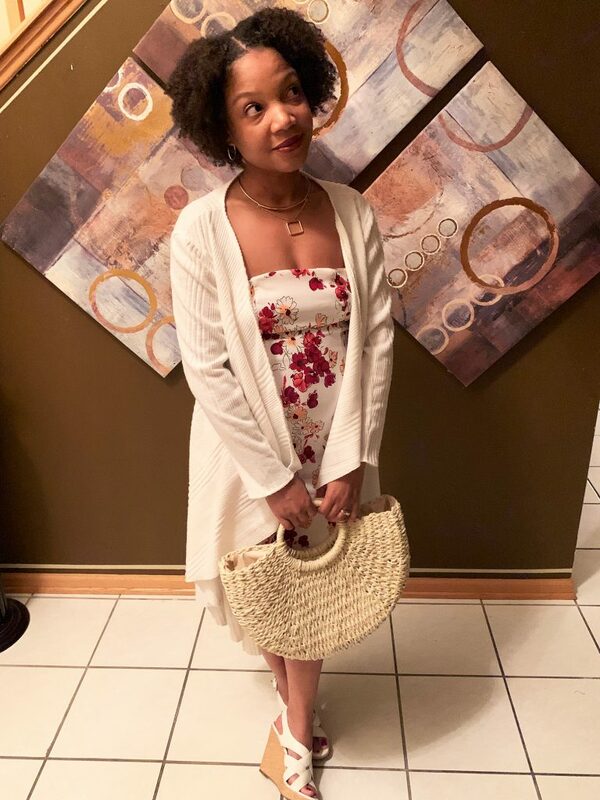 This dress is a strapless, sleeveless tube dress with a really pretty print that I purchased from an online thrift shop. The last time I wore this dress was last year at my daughters high school graduation. This pattern was super easy to construct and for a Vogue pattern, I found the instruction very beginner friendly. I think anyone with basic sewing knowledge can tackle this one. I chose a very light weight cotton, with a small amount of stretch and I have no idea where I got it from. LOL. I think that your accessory really make or break a look. 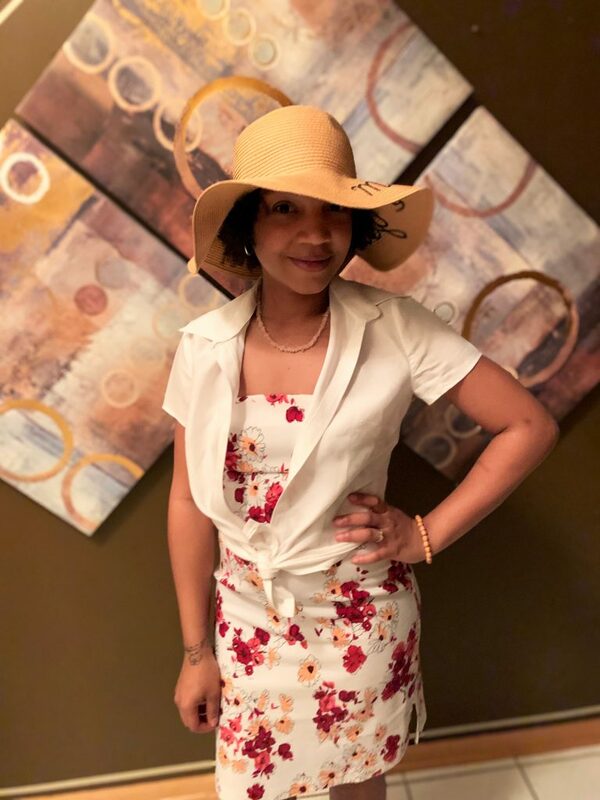 By pairing this dress and shirt with a straw hat, it was really tied in well together. 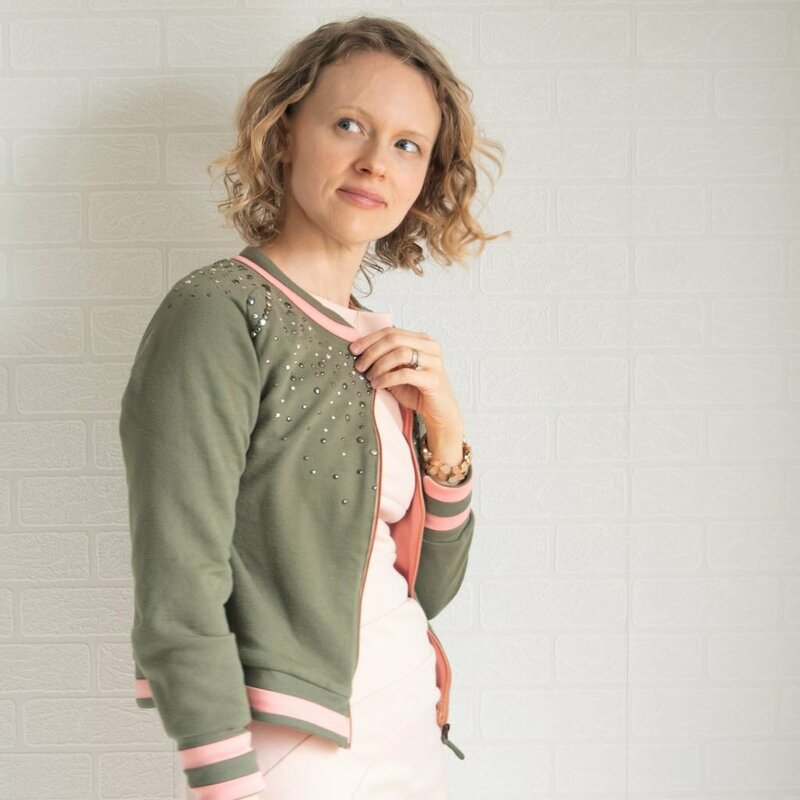 I chose to make the super popular Madison Cardigan from Sew Style Me. I have admired Eryn from afar for quite a while now. She’s very classy and I just love her style and I feel super appreciative that I had a chance to make one of her patterns. Let me tell you…. if you have never made any of her patterns, please do yourself a favor and try it. The instructions for this one were literally only 2 pages, and I think it only took me about 1.5 hours to complete, including cutting time. This is a cardigan that you NEED in your wardrobe. 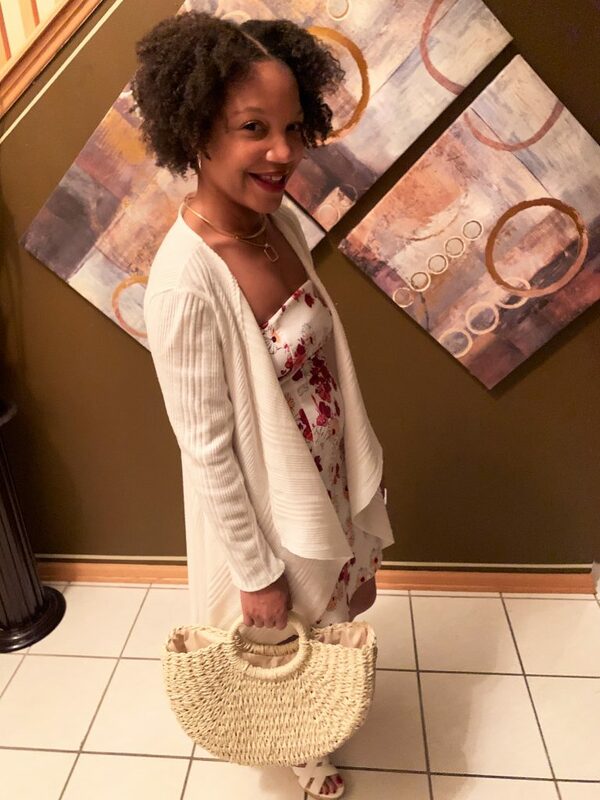 I envisioned myself going out to dinner with my husband after a busy day of shopping in the Florida Keys, hence the straw tote. You know those summer nights where it gets too cool to wear a sleeveless top? Yeah, that’s what you need this cardigan for. I sewed a size small with absolutely NO changes, which is different for me. I didn’t even shorten the pattern!! I chose a textured sweater knit that has been in my stash for a long time, which I think I purchased from JoAnn’s. Doing this years’ challenge really forced me to think outside the box. It’s super easy to just sew a dress or a top but what I struggled with was piecing items together. Layering isn’t something that I do, however I really like my looks so maybe this might change things for me. I had an awesome time with both of these looks and I’m super happy that Elizabeth asked me back again for the 3rd year in a row. I can’t wait to see what next year brings. Hello! I’m so excited to share my Day and Night Dress looks today. My name is Gillian, and I blog at Crafting A Rainbow and I run the Sewcialists! My base dress for this challenge is a Closet Case Patterns Fiona that I sewed as a pattern tester last summer. I have a full blog post about it, if you want to know more! I wore it a few times in the summer, but then packed it away for winter. This challenge was a great excuse to restyle it for colder months. 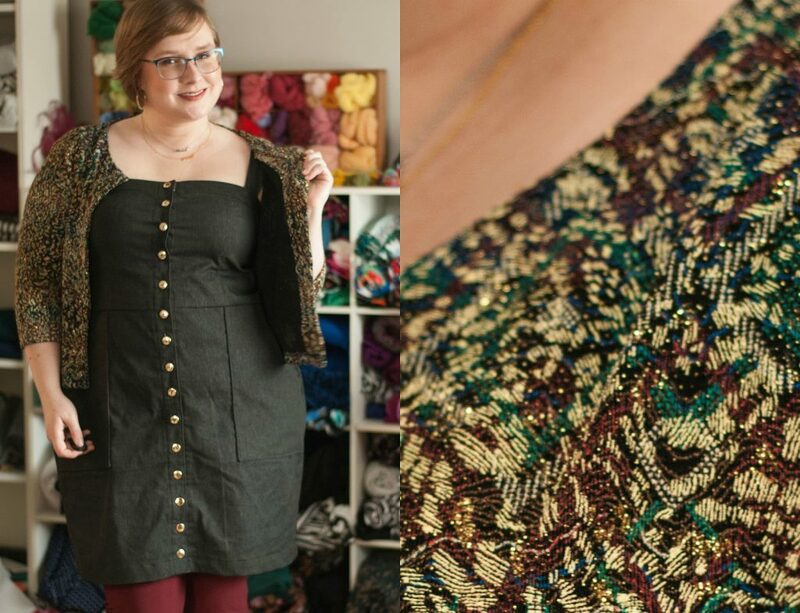 I sew and wear 90% knits, so a dress like this (even in a stretch denim) is definitely something out of my comfort zone! I like to bright, bold, colourful prints, so as a summer sundress this feels a bit chic and classic for me. The great thing about layering it for winter is that I got to mix in more textures and prints, and the solid black became the perfect blank canvas for day or night! When Elizabeth proposed this challenge, my sister had already started knitting me this stunning wool scarf. It was the inspiration for this whole outfit! I pulled in an old Cashmerette Concord tee that had the right shade of oatmeal – I also love how the stripes add in a print and tie into the gradient stripes in the knitting, I made a pair of oxblood leggings from my TNT Cake Espresso pattern, and voila! Let’s talk pros and cons, shall we? I really like this outfit, but it’s not perfect. The dress is quite snug (ie. almost tight) at the top so that it doesn’t gape as a sundress… which means that there isn’t much room for layering over a tee. The shirt does stop the straps from falling off my shoulders though! This is the kind of outfit I’d wear to look cute on the weekend going to a craft fair, where I’d be walking around for a few hours. I wouldn’t wear it to work though, where I need to be able to sit and move around a lot. Overall, it shows me that I’d enjoy an overall type dress specifically made for winter layering, which is good to know! And now, here’s my night look! It is… wait for it… another Cashmerette Concord! I mean, why use two patterns when you could just hack one? I love cropped cardigans for layering, and this crazy polyester metallic-brocade-with-glitter was perfect! I wish I could show you how truly tacky and fabulous this fabric is! It’s photographing much more elegantly than it is in real life! I finished the edges with self-drafted facings. Now, you might be saying, “Gillian, you just made two outfits you like and then said you wouldn’t wear either of them!” Well, yes, that’s true. But this was still a good learning experience! 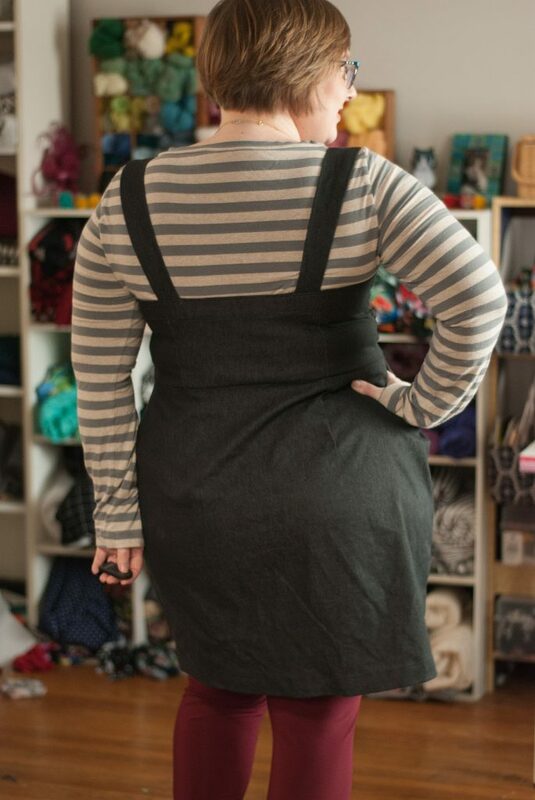 Now I know that I’d enjoy a looser overall dress for winter, and I remember how great I do feel in this pattern. As I mentioned, this dress was sewn as pattern testing, so it might be worth making another version with the tweaks to make it perfect! I’ve already worn my new leggings with a few other outfits, and the gaudy knit cardigan is ready to be paired with a tank and jeans. I’m totally in love with the shawl, and now I know it pairs well with this top. The dress itself is the part that wasn’t perfect… but coming up with ways to wear it in winter was still inspiring! I love the format of this year’s Day and Night Dress challenge. It reminded me to play around with my clothes, and I had lots of fun making two whole new outfits with just a pair of leggings and a t-shirt pattern! Thanks Gillian! While you’re here, be sure to check out Mesha’s gorgeous remix! 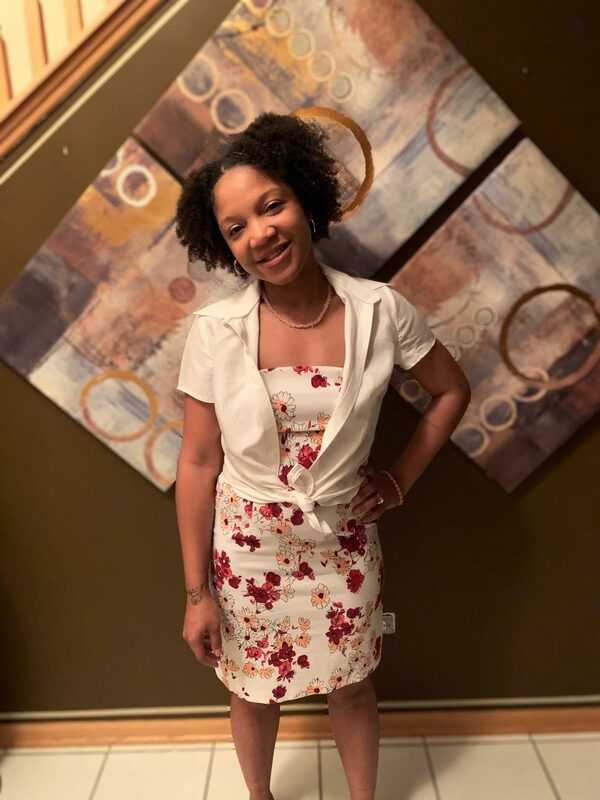 Welcome Mesha of Keamesha. 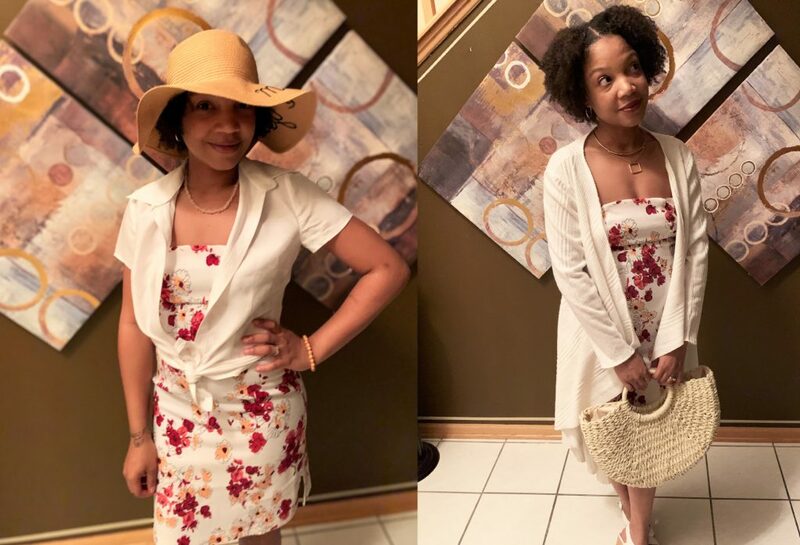 She’s bringing her beautiful casual style to The Day and Night Dress Challenge and showing you how to add a little bit of polish to your everyday. I’ll let Mesha go for it! Oh, boy was this a challenge for me! 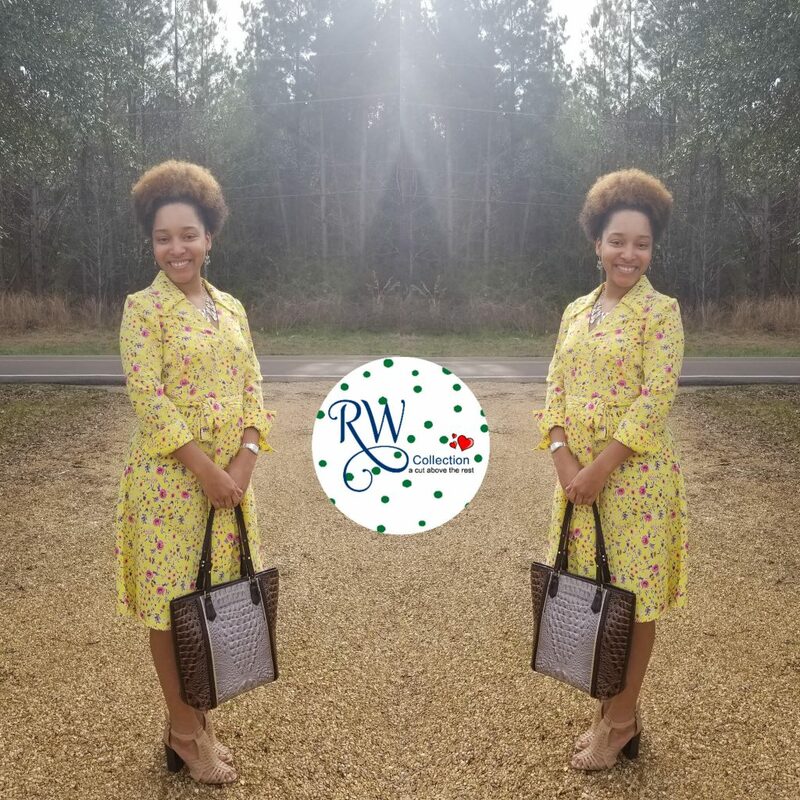 How does a simple SAHM with a bold print dress create 2 looks from one of the 3 dresses she has in her closet? 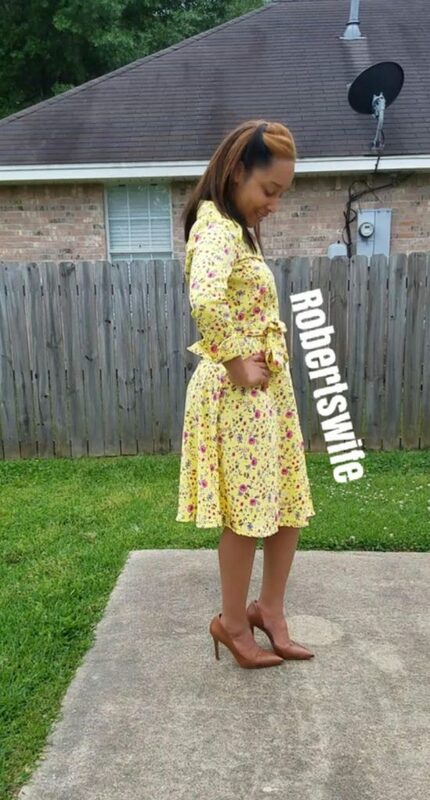 I made this dress using McCall’s 6886 back in December 2017 for a Christmas party that my husband and I attended. I’ve only worn it once and being that we rarely go on fancy dinner dates or engagements, I knew this was probably going to get one good wear out of it. The dress is made using Liverpool knit from one of my fave small businesses Sew Blessed Fabrics. My style is ever evolving. Right now most of my looks are classic, modern, comfortable, and functional. Whenever I make a garment my first thought is “will I be able to manage a toddler in this?”. After I got the function of the garment figured out, I then look for fabrics that are comfortable but at the same time, it’s classic and clean. I’m not big on prints, but lately, I’ve stepped a bit outside of my norm and decided to start using fabrics with bold prints. My every day requires flats and some sort of layering garment. So I decided to style my dress with a pair of dressy flats and the Bondi shirt pattern from Sinclair Patterns. It’s a basic shirt pattern that I modified. To achieve the look, I raised the neckline, omitted the neckband and used a catchstitch (vintage technique) to hem the neckline. I also shortened both back and front pattern pieces by 5”. For the waistband, I used the same fabric as the sweater, I cut the length 4” shorter than the finished waist and 7 ¼” for the width, I attached using a ⅝” seam allowance. Because the pattern is semi-fitted, I went up 3 sizes to create a semi-fitted sweater look. I used a fleece backed sweater knit fabric from Sew Blessed Fabrics. The dress print is bold and busy, I had to make sure my garment of choice has to be simple. Because of the simplicity of the sweater, it can be worn quite often and can be dressed up or down. I’m pretty simple and since my dress has such an elaborate print, I decided to stay away from any garment pieces and opted to go with an accessory. I made a basic zipper clutch. I believe bags complete any evening look and a clutch, in particular, adds a sense of elegance. For the clutch, of course, I used the leftover fabric from the dress and lined it with navy broadcloth. To maintain the structure to the clutch a midweight iron on interfacing was applied to the wrong side of the Liverpool fabric. I used Mimi G’s Clutch Tutorial on YouTube on how to create the clutch. I wanted to keep a chic and classic look so instead of making a foldover clutch like the one in the video, I used my own dimensions of 12” x 9”. This challenge actually made me reflect on how I’m still not stretching my creative capabilities. Thinking back I think I could’ve actually made an ankle length flowy duster using Double Georgette or Challis fabric for my night look. Overall, I’ve learned that it’s okay to be simple, but simple simply doesn’t mean BORING! 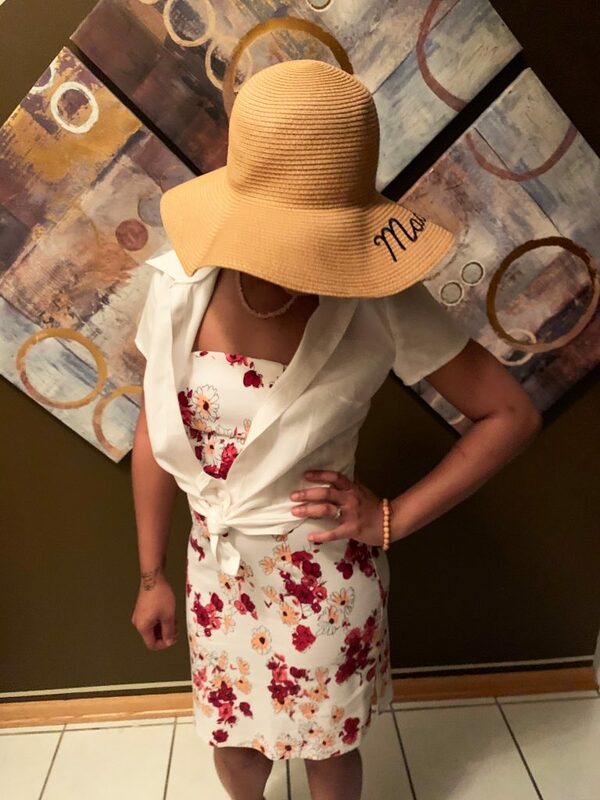 Big thanks to Mesha for being a part of The Day and Night Dress Challenge! 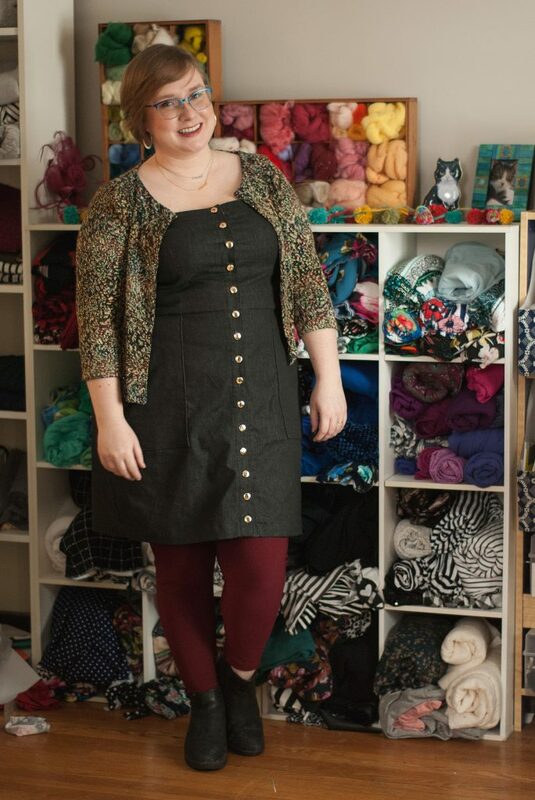 Grab another cup of tea and see how Gillian’s bringing her colorful style to her own dress! I joined the DAY & NIGHT DRESS CHALLENGE! I don’t typically participate in sewing challenges, probably because I was always so busy sewing for events. Nonetheless, when I was contacted by Elizabeth of Elizabeth Made This, inviting me to join the line-up of Bloggers and Vloggers for the challenge this year, I accepted. However, it wasn’t a “yes” because I haven’t participated in the past. Nor was it a “yes” because I would feel bad saying no. I said “YES” because of the TWIST she put on it this year. 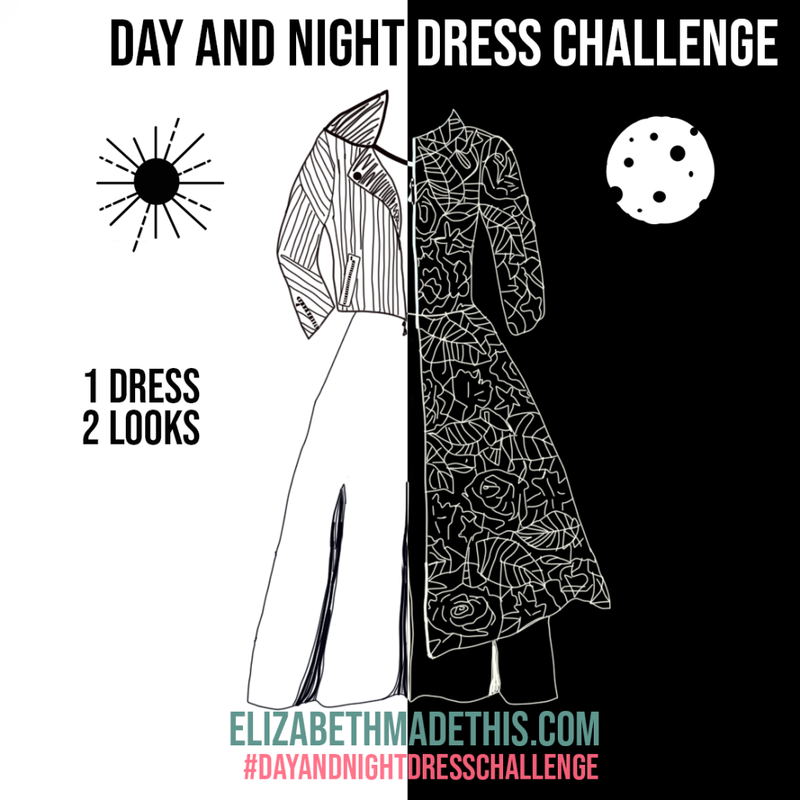 If you’ve never followed the DAY & NIGHT DRESS CHALLENGE in past years, here’s how it worked. 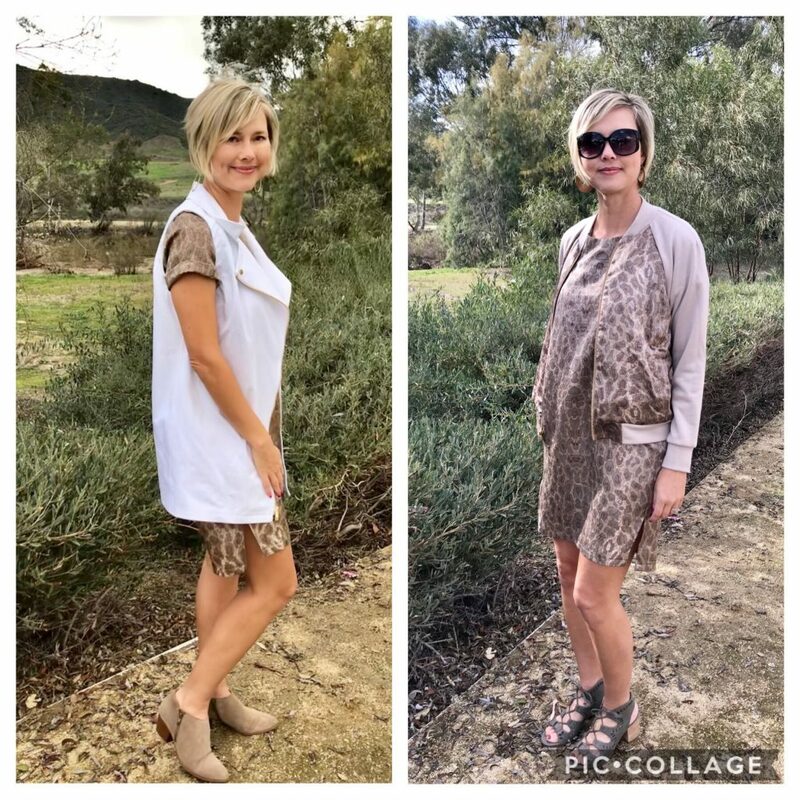 Sew two dresses–a daytime look and a nighttime look. 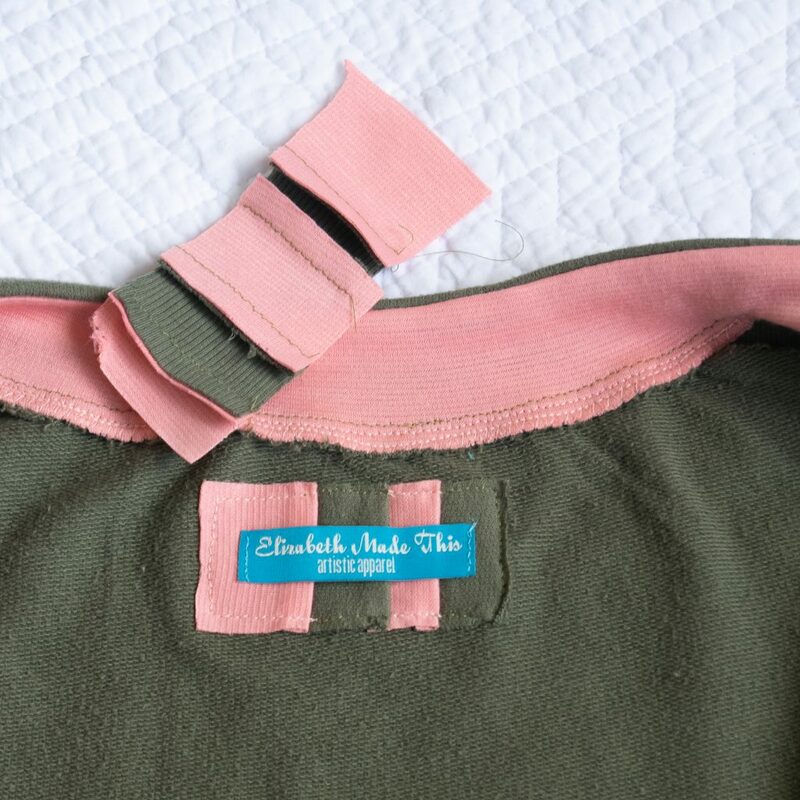 This year, Elizabeth threw a curve ball, put a different spin on it and I LOVE it because it’s totally relevant to my new sewing focus, which is to sew garments that I will actually wear, garments that fit my style. I would describe my style as Classy & Ladylike. Whether I’m wearing a pair of jeans, or full length ball gown, I aim to present myself as a woman of class, grace and dignity–Ladylike. Here’s the Challenge! Choose a dress from your closet that you never wear. 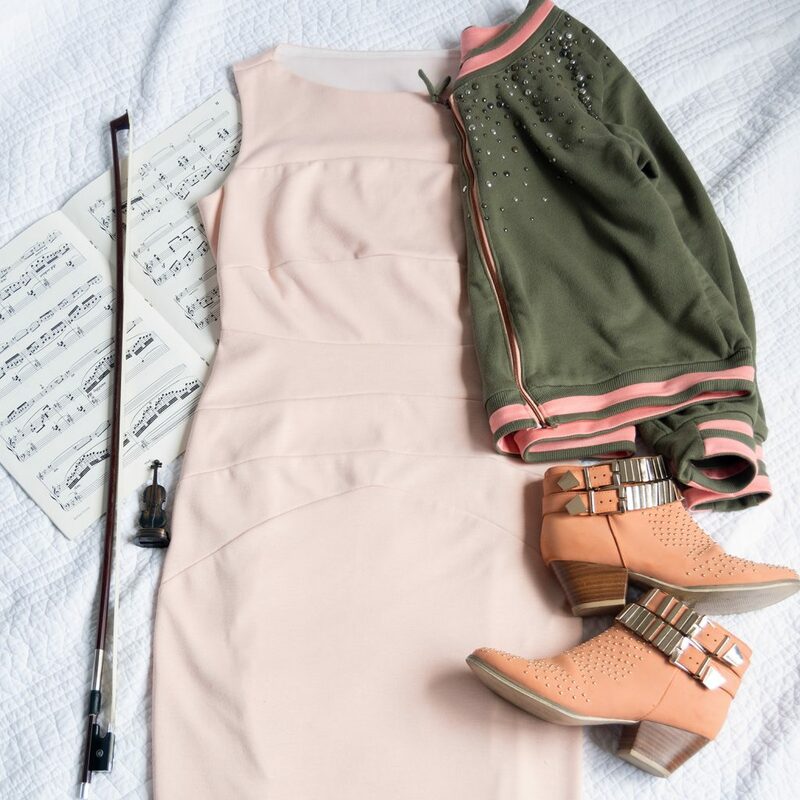 Create two accompanying pieces, accessories, etc. to give the dress both a day and night look (Insert angelic music). As I contemplated this, I quickly realized that I was challenged before even starting the CHALLENGE. Hahaha! I couldn’t decide which dress to work with, but finally decided on this gorgeous Sweater Knit Bodycon Dress that I made in 2017. The pattern is from the McCall’s “Learn to Sew” Collection, McCall’s 7531, and I used a ribbed sweater knit that I purchased from the Michael Levine Loft in Downtown Los Angeles. 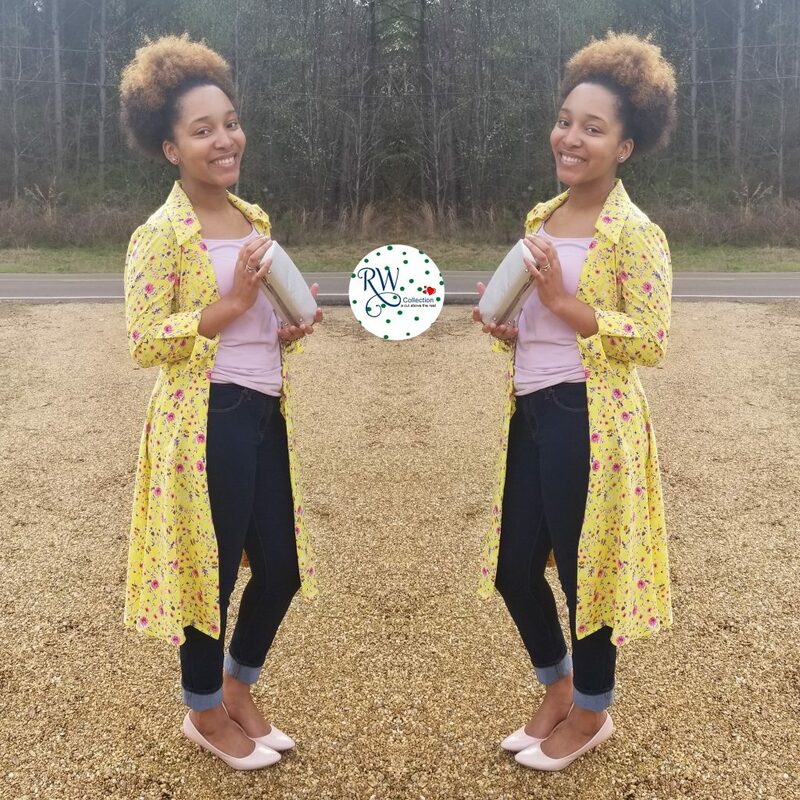 I wanted the day look piece to be something I could wear with many other garments, so I chose to sew a cardigan/duster. This is another McCall’s “Learn to Sew” pattern, McCall’s 7476, with a lightweight sweater knit from my fabric collection that I purchased from The Loft at Michael Levine’s in Downtown, Los Angeles (Hmmm… I’m seeing a pattern here). The duster will be worn with other dresses, jeans, pencil skirts, etc. The possibilities really are endless. I plan to wear it to lunch dates with my girlfriends, the movies, church, shopping, casual events and parties. Heck, I can wear this cardigan almost anywhere. Yes, exactly what I need in my wardrobe–versatile pieces. I went back and forth a lot on the night look. I couldn’t decide what to do, but finally settled on a vest. I knew I wanted faux fur and beyond simple. I have a vest pattern in my collection but I needed something with zero design features. Therefore, I went to JoAnn’s and purchased Butterick 5359 (when patterns were not on sale)—-Breathe in—Breathe out!!! You KNOW we don’t do that! It was EXACTLY what I was looking for though, so I didn’t feel too bad. I sewed View E with only 2 pattern pieces. Now that’s what I’m talking about! Can’t get any easier than that. I purchased the faux fur from Joann’s about a year ago, and lined the vest with a jet set knit from my collection. After completing the vest and trying it on with the dress, it wasn’t enough. I needed something to give it that “PUNCH” and the first thing that came to mind was a clutch bag. What a GREAT idea, right? Yes, BUT, what I didn’t tell you is that this was my first time sewing with faux fur. I learned what NOT to do. DO NOT CUT THROUGH THE FUR!!! Cut the backing only. What do I do? It was taking too long cutting that backing with scissors, so I decided it wouldn’t be that bad cutting the fur since the pile is low. BIG MISTAKE!!! Honey, I had fur all over my face, in my hair, up my nose, on my lips—just EVERYWHERE! Therefore, I knew that if I was going to make another faux fur anything, I needed to do it properly. I pulled out my box cutter and OMGosh, quick, easy and NO FUR EVERYWHERE! I didn’t have a pattern for the bag, so I just drafted one of my own, making it up along the way. Hahaha! I styled the look with my black high-heel boots, a belt that I received in a Swag Bag from the Fierce 50 Weekend in 2017. Unfortunately, I don’t remember the name of the sponsor who provided it. I didn’t like the belt and never had any intentions of wearing it. It’s gold and just not my style–I thought. In fact, it’s been sitting in my giveaway pile that I haven’t removed from the house yet. The vest needed something extra to elevate the look. I don’t wear belts, so I didn’t have ANYTHING to wrap around my waist. Then I remembered this gift and decided to give it a try. Honey CHILE!!! I LOVE it! OMGosh! The vest is another versatile piece that I look forward to mixing into my wardrobe. I can’t wait to wear it with a turtleneck t-shirt, skinny jeans and a pair of boots. I can also envision it with a short-sleeve maxi dress. I don’t wear mini skirts but someone can totally rock that look with a long-sleeve crew neck t-shirt and a pair of booties or sneakers. Yes, yes, yes, honey! Would you like to join the challenge for a chance to win some amazing prizes that are being offered from a lot of awesome sponsors? Check out Elizabeth Made This for all the details plus check out all the inspiration posts. You have until March 17th to complete your looks. Hello! 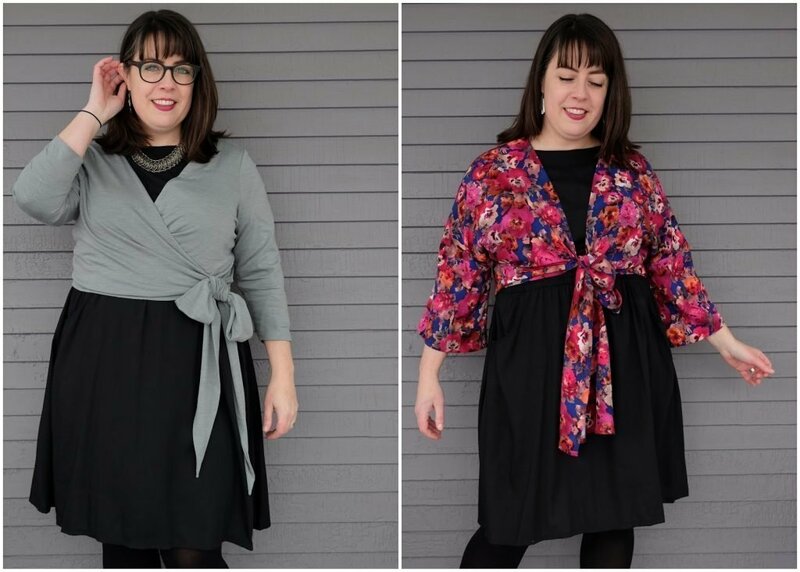 This is Meg from Cookin’ and Craftin’ and I am so delighted to be participating in Elizabeth’s Day and Night Dress Challenge for the third year in a row (check out my past Day and Night Dress Challenge projects here and here)! I’m very practical by nature; you don’t see a lot of frosting in my sewing, typically, and I try not to sew things that won’t work with my daily life. As a result, this challenge to rejuvenate an underwhelming or unworn dress by styling it with other handmade pieces and accessories really appealed to me! For my dress, I chose this black tencel Sew DIY Lou Box Dress 2 that I made last year. There is nothing wrong with this dress, per se, and yet I never find myself reaching for it. I think I have worn it once since making it. It’s perfect for this challenge! If I had to guess as to why I’m not wearing it, I’d say it’s some combination of the lightweight fabric, the color, and the sleeve length. I decided I wanted to alter my Lou Box Dress ever so slightly before jumping into the day and night looks: I cut about 4.5” off of each sleeve and rehemmed them to be more of a ¾ length sleeve. Somehow that little bit of wrist makes it feel slightly less funereal. Then I set about figuring out some patterns and fabric to use to jazz it up a bit for day and night! 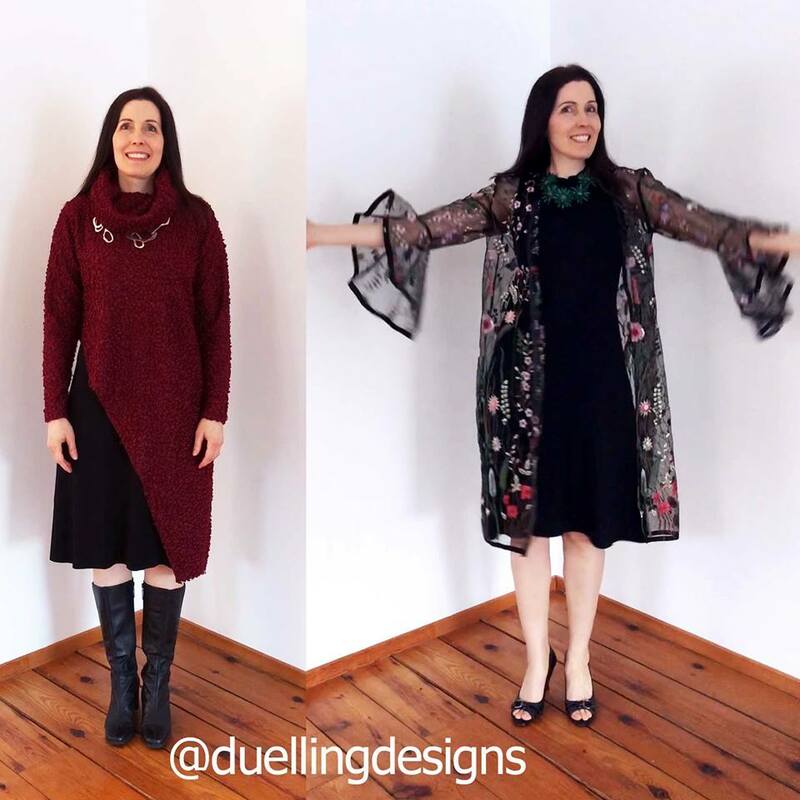 I set some additional challenges for myself, too: I wanted to use fabrics from my stash and I wanted the day and night pieces to work with other items in my wardrobe, not just the Lou Box Dress. 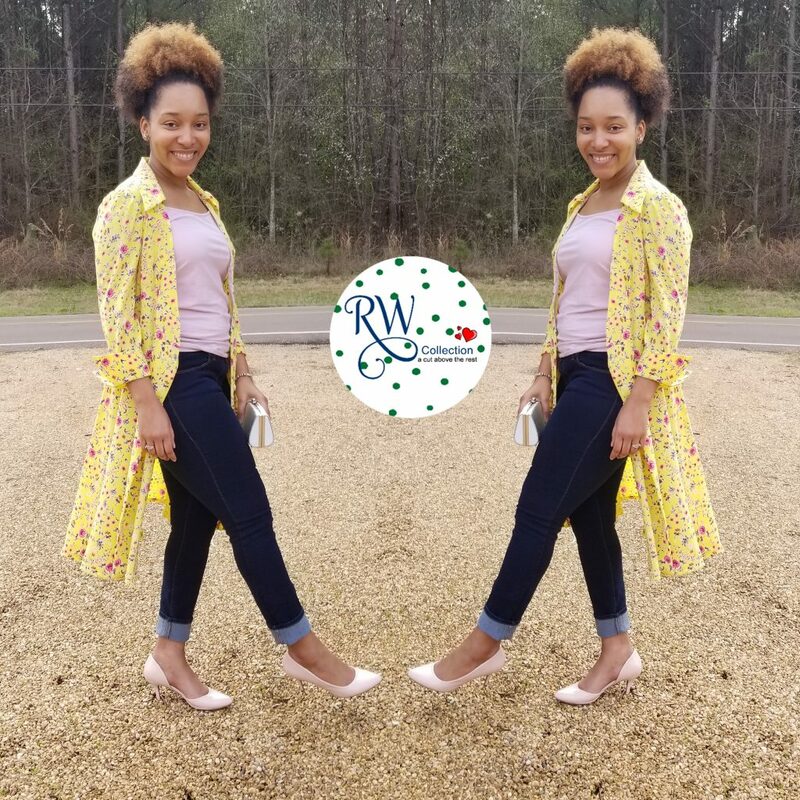 To top it all off, I also wanted the pieces I sewed to count for the Sew Twists and Ties challenge that I am currently running on my blog! Lots of boxes to check here, folks! For my day look, I wanted a sweater of some sort to make my Lou Box Dress a bit warmer/more appropriate for winter weather. I needed the sweater to hit at the high waist, where the dress is cinched in by the elastic. 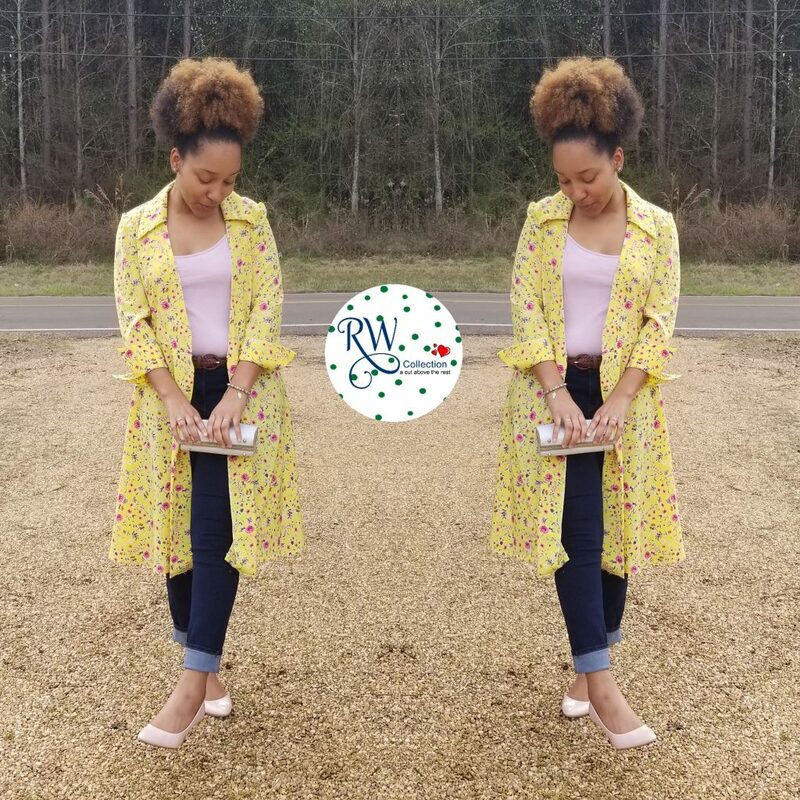 I decided on the the Seamwork Elmira cardigan, a cropped, ballet-style wrap cardigan with a big, exaggerated waist tie (making it perfect for Sew Twists and Ties). 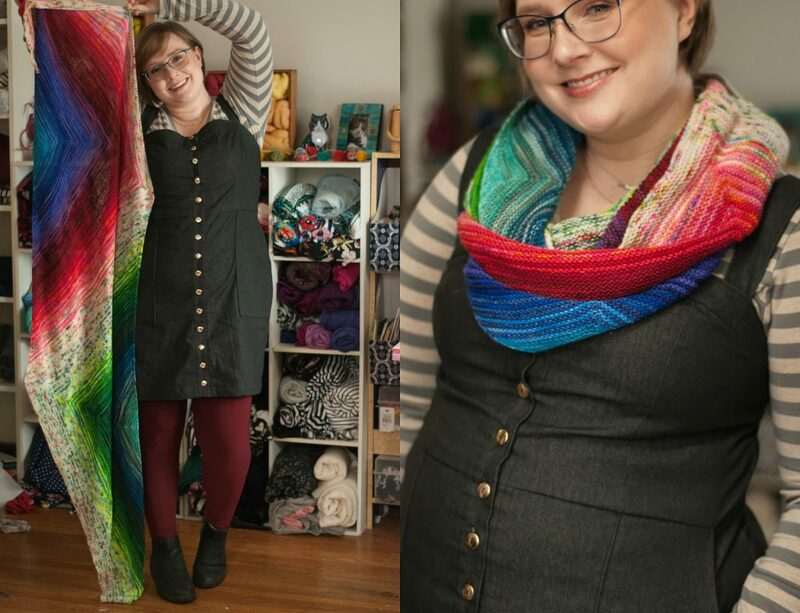 I’ll be honest and say I hadn’t paid much attention to this pattern until I saw this red version by Sewrendipity, at which point I neeeeeeeded to make one! The stash fabric I chose is some lovely dove grey superwash wool jersey that I bought from Fabric Mart last year, which was easy to work with, a pretty color, and met my objective of being warmer than the tencel my dress is made from! For the “night” look, I wanted something a bit loud, but also something I wouldn’t wear exclusively at night. Vermont is not a place where a lot of dressing up happens! I chose a beautiful, bright floral from my stash, which I think is like a rayon lycra woven of some sort. I got it in Vietnam on one of my trips before I moved back to the U.S. Drapey, slightly textured, a bit of stretch, and some gorgeous colors: royal blue, magenta, hot pink, tobacco brown, and a hint of black to tie it into my dress. The pattern I chose is Simplicity 8655, a Mimi G pattern. I bought this pattern because I liked the wide-sleeved tie front top, but also those awesome high waisted pants! 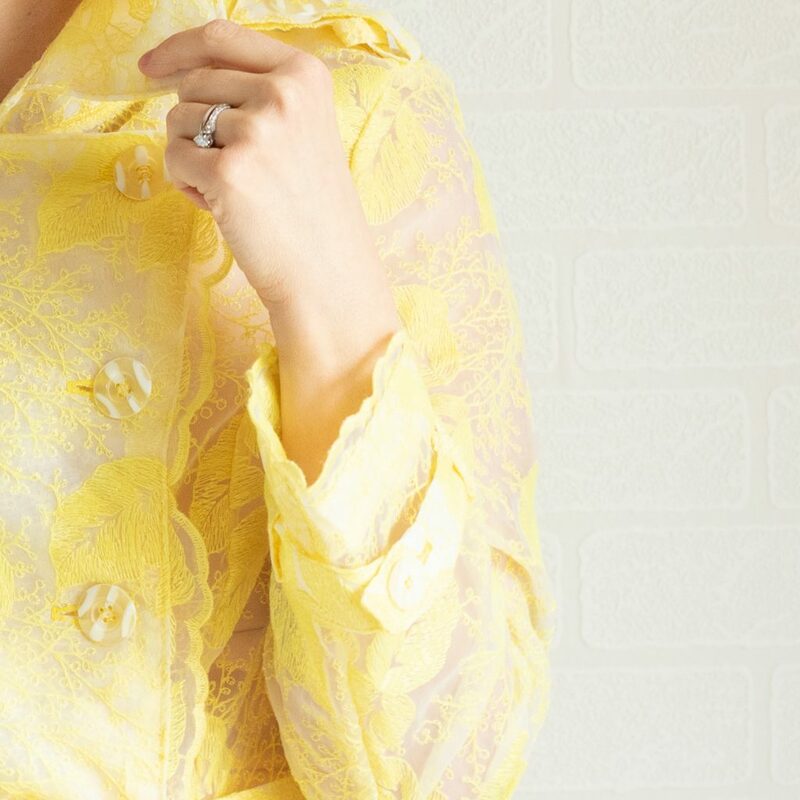 I figured the simple but elegant lines of the top paired with a saturated colors of the floral I chose would look great on the blank canvas of my Lou Box Dress. Plus, another tie, so my Sew Twists and Ties box was checked! Now I just wish I had some fun, boldly colored shoes to go with it… my boots look a little bit sad in comparison! Thank you again to Elizabeth for hosting this fabulous challenge! I really had a lot of fun this year figuring out how to reinvigorate my Lou Box Dress and make it wearable for multiple occasions! Thanks Meg! There’s lots more Day and Night Dress Challenge happening around here. 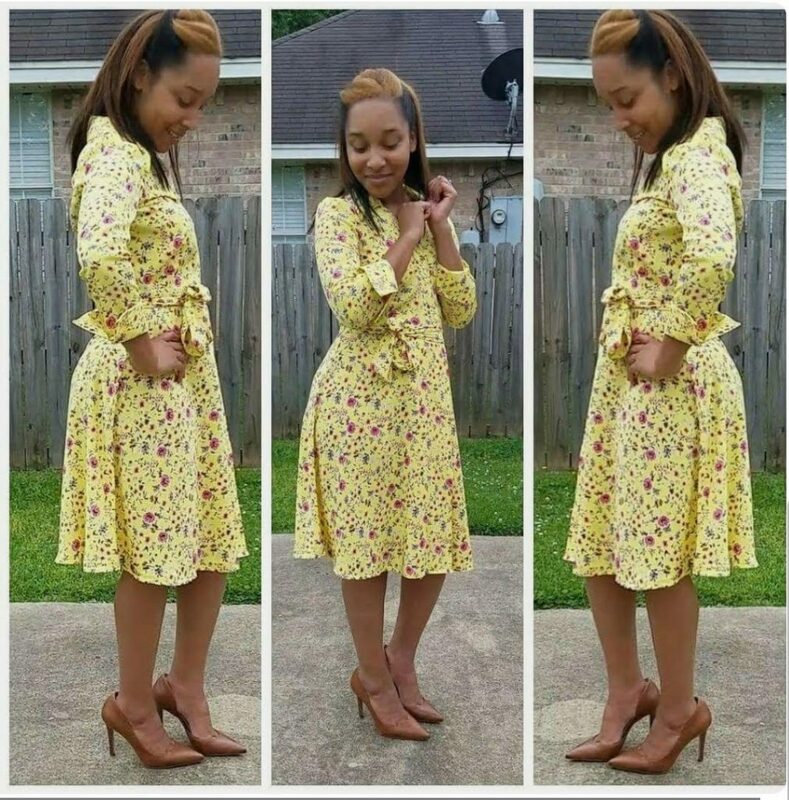 Don’t miss how Anita and Je’Tua are remixing their old dresses. Today I’m welcoming JeT’ua of Life of Robertswife. I’m so glad she’s a part of this challenge for the third year now. I particularly love her contribution to last year’s challenge as well as some of her lovely dresses like this fabulous tie-dye day dress. I’m passing the mic to Je’Tua! Hey Yall! 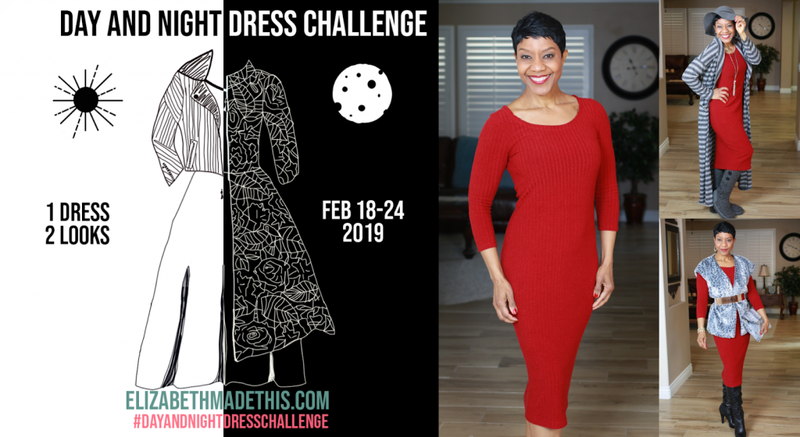 I’m elated to participate in the Day and Night Dress Challenge again! This year’s challenge was to take a dress that has been just hanging around in our closet, desperate for attention. The dress that I chose has been in my closet for about 2 years. It is Butterick 5030. 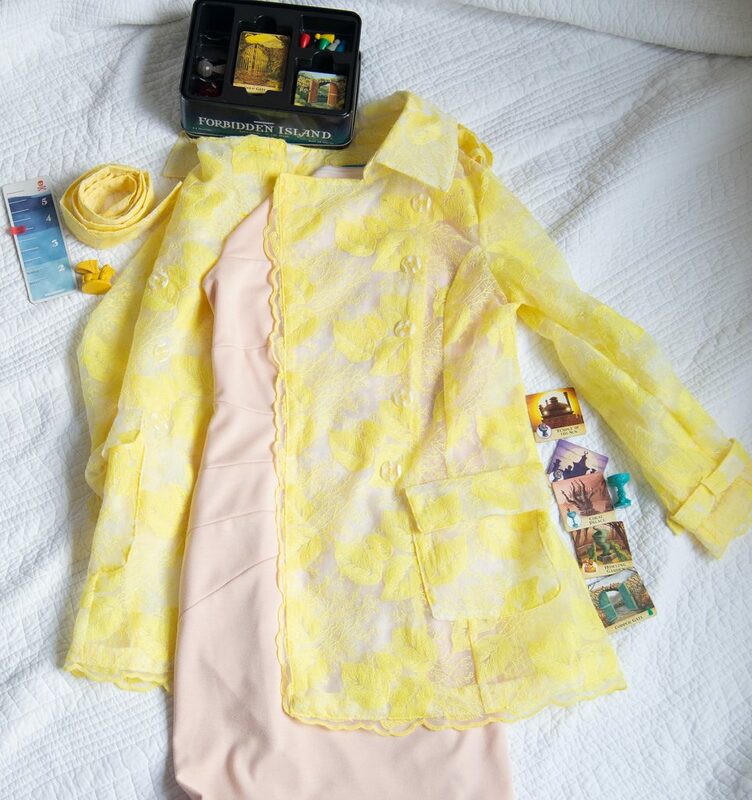 This dress was created specifically for the Easter Spring Dress Challenge in 2017. I have worn the dress maybe 2 times since it was created. I hadnt worn it as much because I know I wanted to change the closures….which i still have to do. If I could describe my style in 4 words, they would be: Modest, Elegant, Feminine, and Classic. When I choose a new garment to create, I look for the statement that it will make once worn. I want it to be simple, and effortless. My closet is full of beautiful dresses and skirts that emphasizes these 4 words. As I chose the dress for this challenge, I wanted to be consistent in portraying: modesty, elegance, femininity and class. I even sought the help of my husband. I had my choices down to 2 dresses, but I think I did well with Butterick 5030. My everyday look has to be an effortless, yet feminine look. I paired Butterick 5030 with a pink tank, a pair of skinny Jean’s, and pink pumps. As a homeschool mom, I want to get cute as quick as possible. It’s easy to pull on a pair of jogging pants and a tee, but an effort needs to be made so that we dont forget who we are. I used the dress as a Kimono/Cardigan. 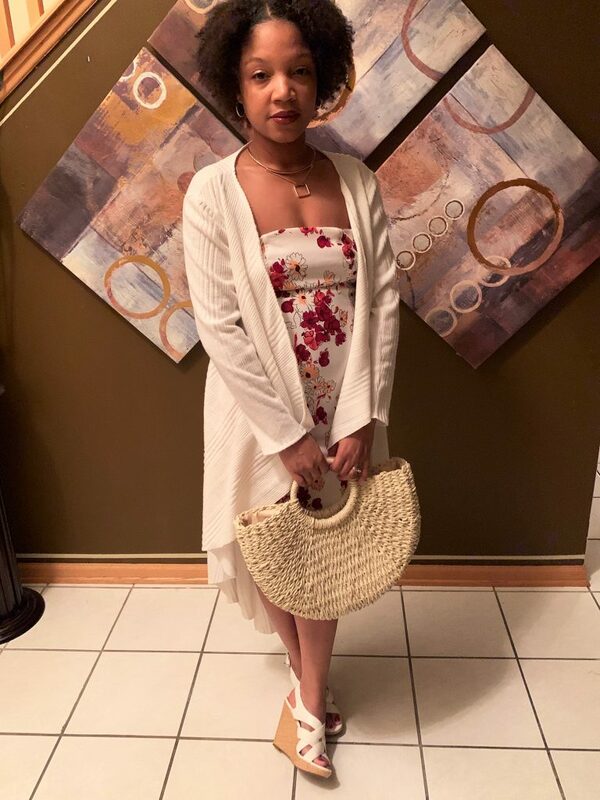 It’s perfect for spring with the 3/4 length sleeves.The pink pumps paired with the silver clutch gave just the feminine touch to finish the look. In creating my Night Look, I merely envisioned a Date Night with the Most Handsome Man I know, my husband. I wanted a look that wouldnt take too long to get together. I’m always told I take a rather long time in getting dressed. I can even admit to changing outfits after getting dressed. I accessorized with a Paparazzi jewelry set and my Anniversary gift, a Brahmin purse. I also have on heeled sandals with provide a comfortable, cute look. They are just the right height, where my feet wont hurt if we decide to take a stroll afterwards. I loves this year’s challenge. It brought out creativity that I didn’t know I had. I see many women in fashion and often admire their styles, when I could have just done the same with what I had. I usually give away or throw away clothing, but now I will definitely take on a new approach. Thanks Je’Tua! There’s lots more Day and Night Dress Challenge happening around here. 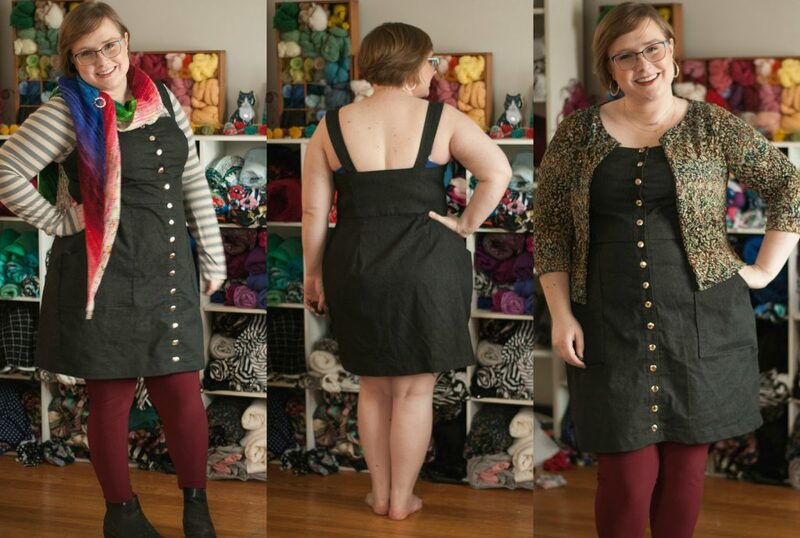 Don’t miss how Anita and Meg are remixing their old dresses. It’s always a little intimidating to start thinking of how I’m going to go after my own challenge, and this year’s Day and Night Dress Challenge has been no different. For this year’s twist, I found a neglected ponte dress and went on a color adventure. 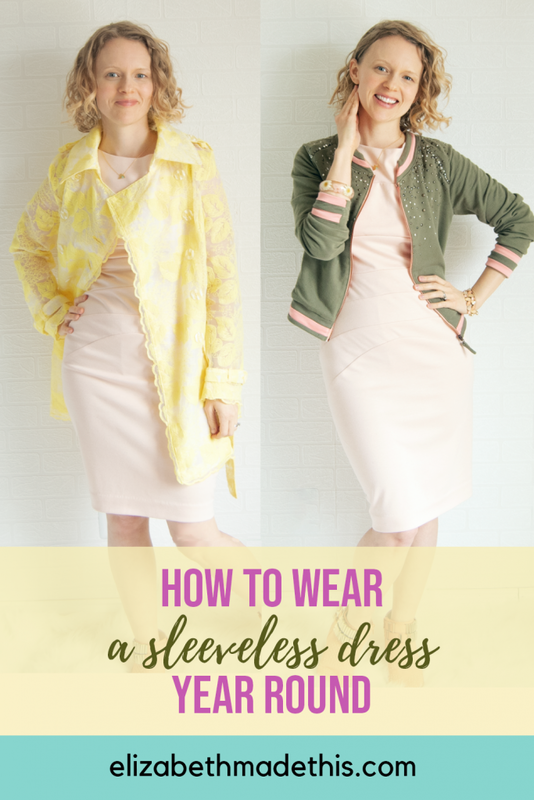 A sleeveless dress in winter–literally what was I thinking? 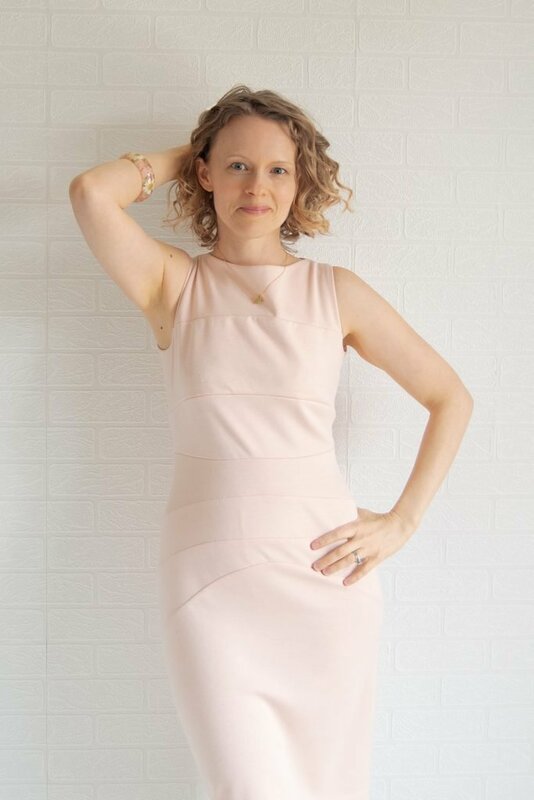 My chosen dress is this blush ponte dress. The pattern is Burdastyle 9-2010-122. I made it a few years back for an easy wearing dress for the opera. It’s made its way to a wedding too. With cool style lines and the comfort of a knit dress, why on earth haven’t I worn it more. 3 words: sleeveless, Colorado, ponte. What a trifecta of unwearable those words have become! When it’s warm enough to wear the dress, it’s too hot for the ponte, and in winter it’s a freeze fest. My goal for this challenge was to make this otherwise very wearable something that works. I don’t know about a style, but I do have a really clear aesthetic. It’s Spring all year round as far as color is concerned, and I’m constantly looking to add texture to everything. My husband says I’m “obsessed with asymmetry” (true). I do like to be comfortable, so yes to bright sneakers and no to button down shirts. If I had to throw 3 words at describing my style, it would be classic, creative, and eclectic–things that can at times be at odds with each other. Whenever I start a new project, I steer towards fabrics I want to work with. If a fabric is an ugly duckling, I will happily reach for the dye. For this year’s Day and Night Dress Challenge, color was my muse. Here, blush meets olive, coral, and lemon. My everyday wardrobe is a lot of comfortable. My everyday wardrobe has to deal with bustling around driving my kids to school and soccer and church. I teach violin part time after school too. Violin requires a lot of freedom of movement for me so I don’t repetitive motion myself into pain. Knit dresses and tops are ideal. With this in mind, I wanted to create a simple bomber jacket/cardigan combo. I found a great olive french terry sweatshirt to refashion. I cut it up using Ottobre 5-2015-15 . I’ve actually made this pattern now in various forms 4 times now. The saddle sleeves are an interesting line and a fun alternative to a raglan. The original pattern is a hoodie. To get to a bomber jacket, I quick drafted a little collar band and cut it from my “ribbing”. It also needs a center front zipper which is easily done. Just add 3/8″ to center front and cut 2 fronts. Boom. Easy center front exposed zip. Yes, there’s dye on the zip! My particular zipper was white, but I dyed it with Rit DyeMore in yellow, super pink, and orange to get this peachy coral color. This dye is my absolute favorite. It’s so easy to blend, and I can dye a tiny very small things in under 5 minutes. I love how the metallic look nylon coil picked up almost a rose gold hue with the dye. I kept the length of the jacket as long as I could, but refashions are what they are. To get more length I created my own ribbing with all of the sweatshirt ribbing, some of the sleeve hems, and some contrast coral ponte. I know I’ve steered away from making bomber style jackets in the past because I could never find the right multicolored ribbing. It was a revelation to just piece my own in strips. This will not be the last time I do this! The fronts are lined with the same coral ponte for a little extra warmth and some clean insides. 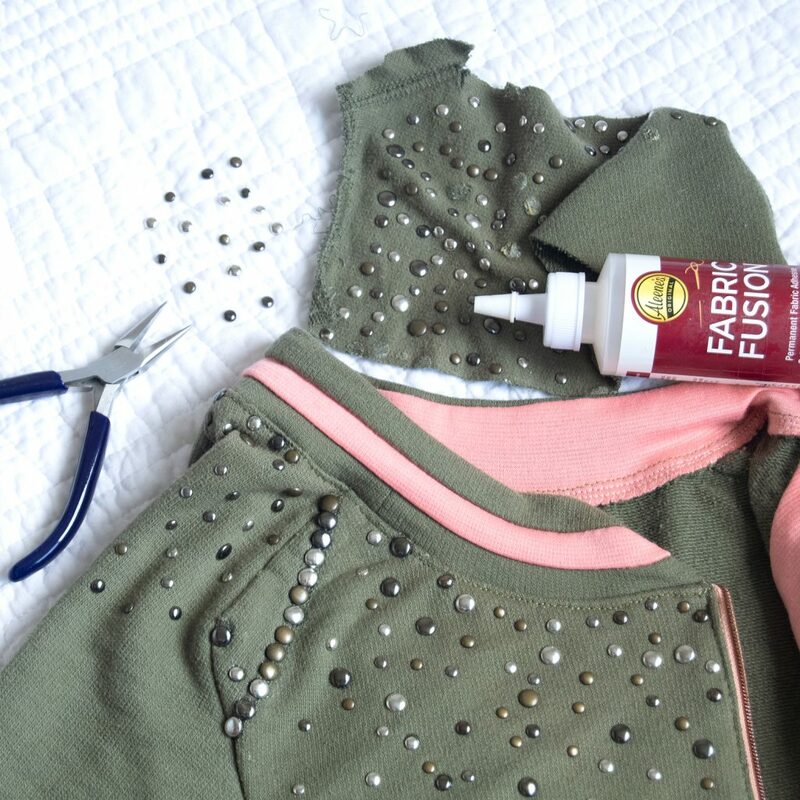 The only tricky part of this whole refashion were the decorative studs. To cut and sew my jacket, I had to remove the studs out of the seam alllowances. Pliers make quick work of it. After sewing was done, I glued them back on with Fabric Fusion. Fun fact: I glued one stud to my forearm which was discovered later that day by my youngest student. This kind of jacket is totally my style. The minimal collar and knit fabric makes it easy to play in, and I can toss it on over just about everything. I’ve already worn it with a seasonally inappropriate sundress and wool t-shirt! I know I’m among sewing people here who aren’t going to think I’m weird, but you all know those times when you see a fabric and it’s like the skies open up and you lose sight of just about everything for a second. So it was with this embroidered organza. It’s positively lemon AND it has a decorative selvage. I found it discreetly hanging out on a shelf at Fabric Mart when I was at their store this last summer. Instantly I knew it had to be a sheer trench coat. It was a specific thought, but I’ve never wavered from the idea. For it, I used Ottobre 2-2014-20 which is a super fabulous trench coat pattern with all the bells and whistles. I will definitely be making a lined version of this at some point. You always have to consider a couple of things when you’re working with sheer fabrics. What seam finish you use is probably #1. French seams are classic, but they were a little too heavy on this particular fabric which is heavy with the embroidery. In the end, I used a cross between a Hong Kong finish and a French seam. You sew the seam regularly, then trim one side of the seam. Next, you wrap the untrimmed seam allowance around the trimmed one and stitch it down close to the wrapped edge. It’s simple, clean, and a way lighter finish in this fabric. 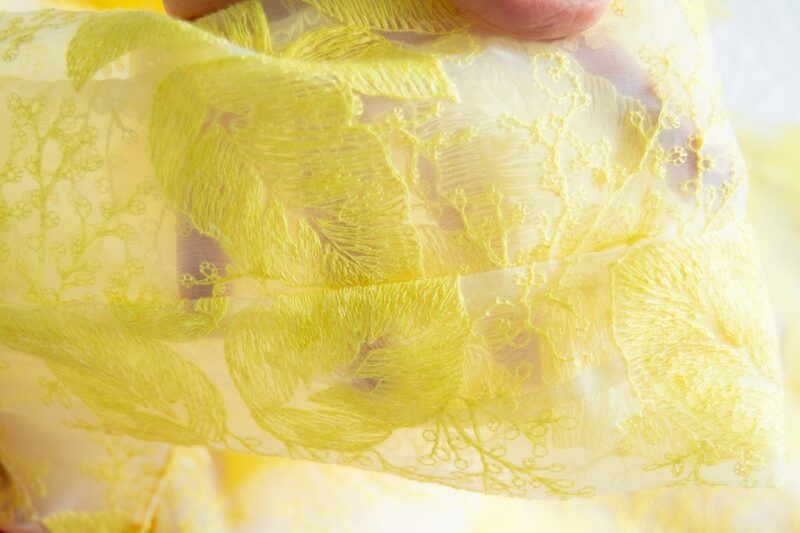 For interfacing, I used silk organza. 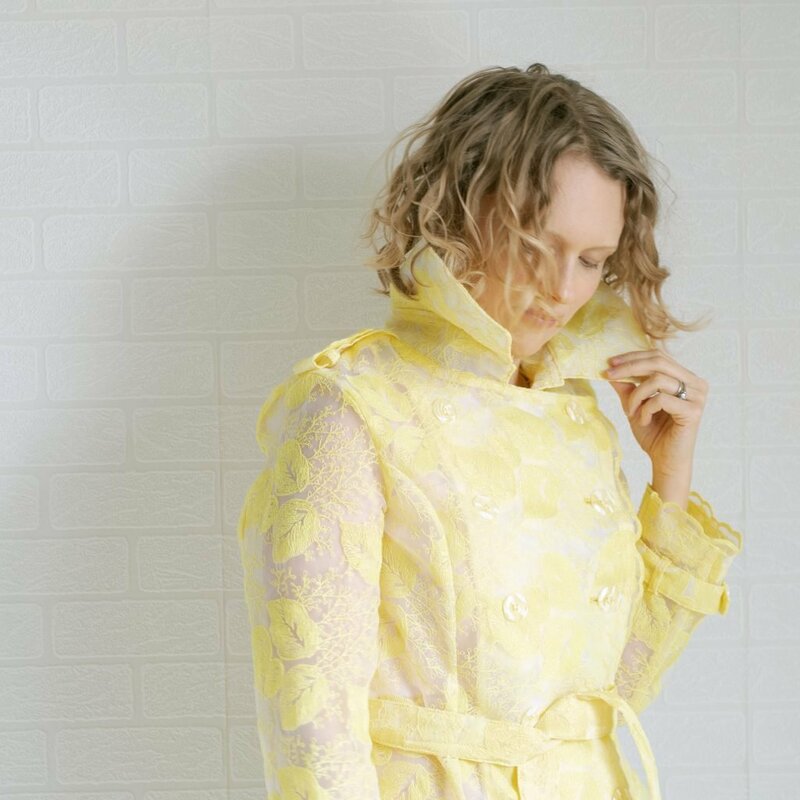 It’s time consuming to hand baste the organza to the fashion fabric pieces, but a popped collar is worth all of the time. The organza gave a lot of structure and stability, so I wasn’t a bit worried about all the many buttonholes or these giant vintage coat buttons. If a fabric has a pretty selvage, use it. Seriously. You’ll thank me later. For this one, I cut 1.75″ strips of the selvage and used them as trim along the front edges and hem. The hems are a little tricky because they’re sewn a little bit like a pants cuff but so the “cuff” sits on the inside, exposing the trim. I’m glad I had enough to add all of the trim on this one. With 3 yards and a double scallop selvage, I used all but about 6″ of the 6 yards! 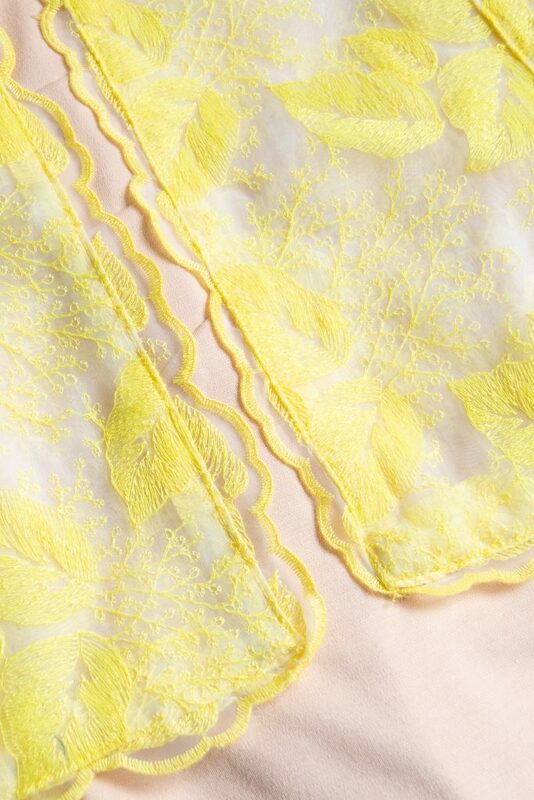 Where is lemon chiffon + blush going? I’d be really tempted to put this combination in a closet and only pull it out on really fancy occasions, but that would be totally against the whole idea of this year’s theme. Nice dinners happen a few times a year, and a night at the opera once every few years. Still, I’m determined to wear this everywhere. Probably I’ll be at the grocery store, absurdly overdressed and happy to be so! For real though, this combination will be for sure making an appearance at the monthly Game Night my family and I attend. We bust out all the nerdiest board games with friends and snacks and it’s all good fun. It’ll be seasonally inappropriate this month, but Spring will be here soon! This challenge has been good for me to help me thinking about how to add more flexibility in my wardrobe. It’s so nice when you can go to get dressed and know that this goes with that goes with this. It super helps with the stress of getting dressed, and the more I do it, the more I love my handmade wardrobe! Are the ideas for your own Day and Night Dress Challenge popping yet? Be sure to check out Karina and Helena’s own adventures! 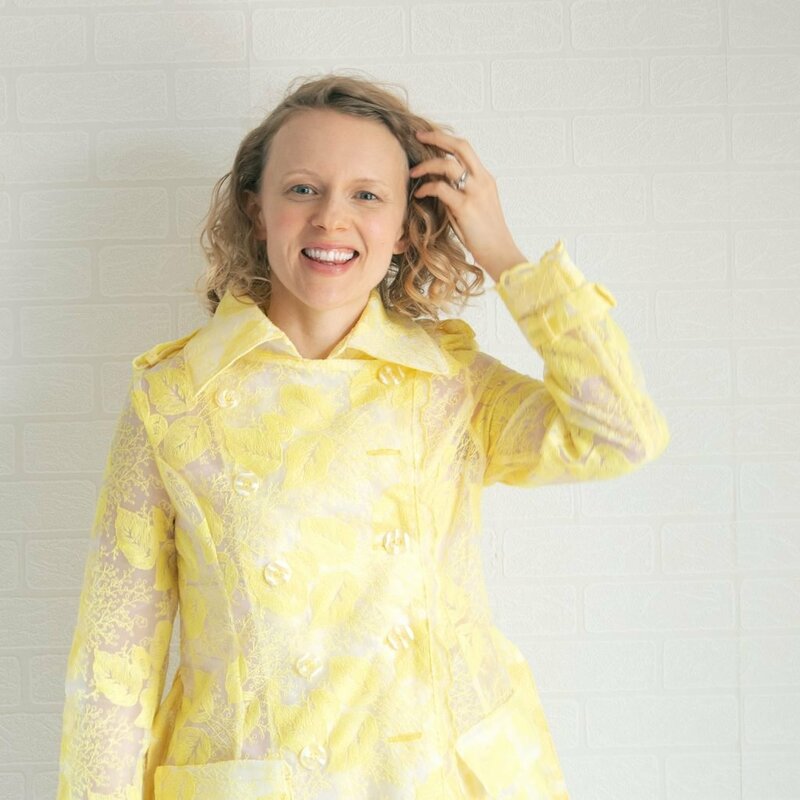 Hi, I’m Helena from GrayAllDay.com and I co-host a monthly garment sewing podcast called Clothes Making Mavens. I was so thrilled to join this tour again, especially when I heard about the fun twist! This challenge really blended well with lots of thoughts I’ve been having about wearing the pieces that I’ve made. I have traveled a few times recently and realized while I packed that while I wear the stuff I make, it is rarely a full outfit of handmade and I am often stuck thinking what do I wear with this? A big part of that is sometimes I sew for the life I long for, and not so much the one I actually live. Does anyone else have that problem? I made this beautiful metallic linen Named Inari dress back in 2016 and I still love it. But this was my first version and I didn’t make a muslin, so I feel it is a little short on me. I don’t think it actually appears too short, but because of the side slits, the skirt can float away from my legs and I feel exposed. When I tried wearing it during the day I was always a tad uncomfortable. So for my day look I created a white denim Moto vest to anchor the dress and bring down the sparkle a little bit. It does exactly what I expected, and even walking over to the park for this photo shoot I felt confident. And it really changed the whole look of the dress! I paired it with my taupe booties and a necklace and I wished I had somewhere fun to go. I know that in a few short months, when it is finally warm again, I will rock this look hard. 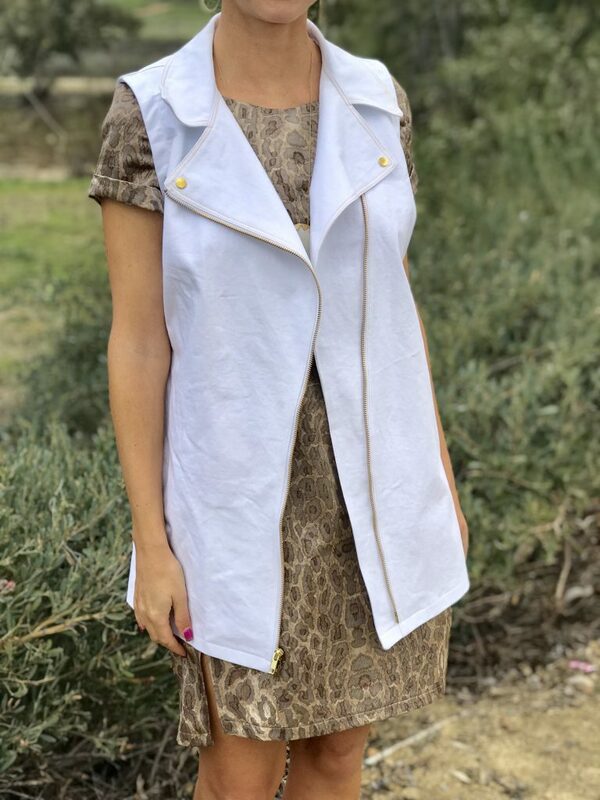 With my thoughts still on the purpose for this challenge, I noticed that I could pair this vest with any number of my handmade dresses and their vibe will also be completely transformed. A vest is such a perfect “completer” piece to add style to an outfit without too much warmth. 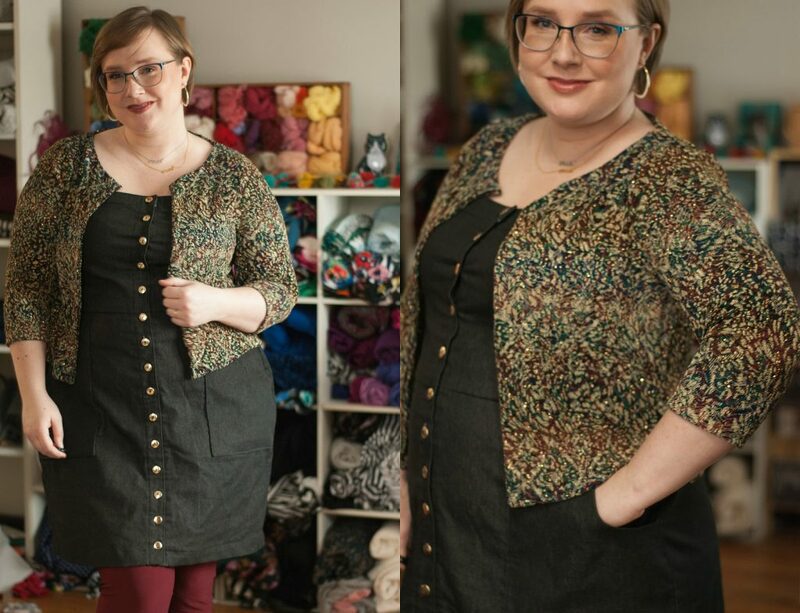 Even better is the fact that this was made from my now perfected Wear Lemonade Mona jacket pattern that I made 3 times in December. I just left off the sleeves. I added bright yellow topstitching to make it more “denim casual” instead of “lab coat” and added shiny gold snaps. I originally made it much longer, but when I really tried it on with things I wanted to wear it with, I cut about 6 inches off and I think this length is cool but versatile. I was sad about that wasted denim, though. Now this night look I had been stewing over for a while. I had just enough scrap animal print linen to eke out only the front and back of the bomber jacket McCall’s 7100. In raglan bomber jackets, the sleeves are the real fabric hogs, so my little scraps were just enough. The neutral knit I paired it with is so soft, and I ended up underlining the linen with it because metallic anything can be scratchy. Consequently, this jacket is super cozy inside. 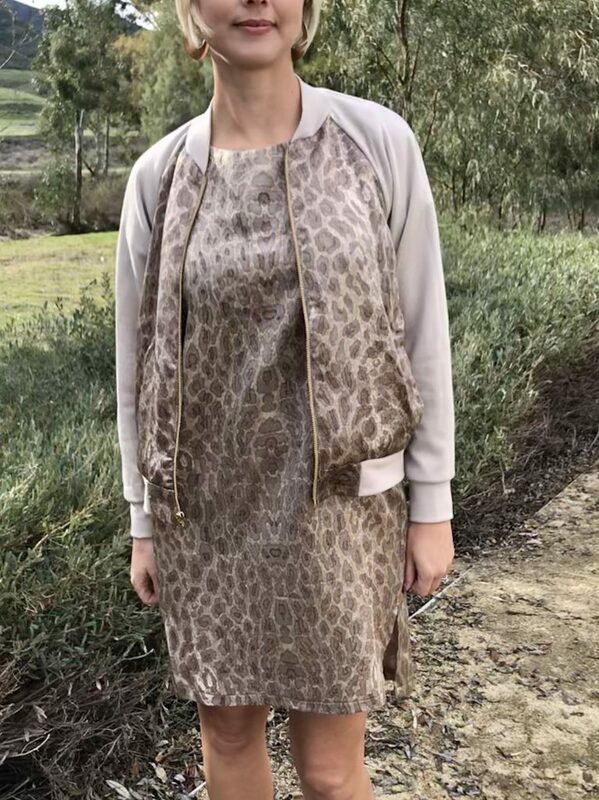 This look is especially great when you go somewhere fancier, but it is cold and you don’t really want to take your jacket off, but the jacket is a distraction from your outfit. This entire ensemble works together, and if I get warm I can take it off. I’m planning to wear it to dinner tomorrow night, and I know I’ll be comfortable and stylish. Some may say that a bomber jacket is not very dressy, and I do agree, but I still think this outfit is elevated by the matched set aspect and the unique fabric. But again, I think I’ll be wearing this jacket with a lot of other items of my clothing, especially my old standby; jeans. The taupe and dusty purpley colors in the print certainly don’t go with everything like a white vest does, but it will look great with blue jeans. 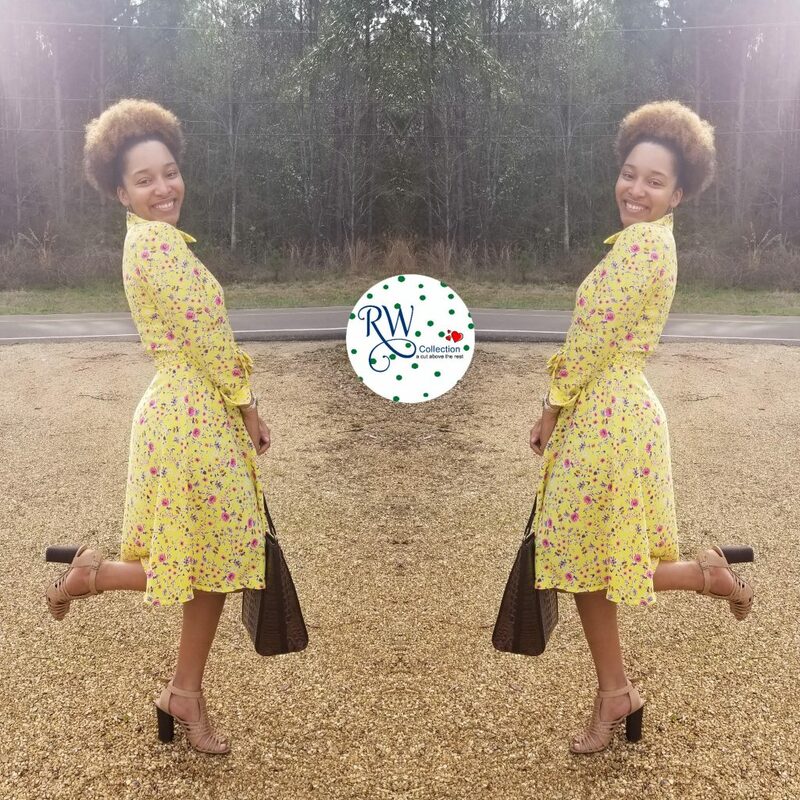 So, not only have I created more wearability for one of my favorite dresses, but I will be able to mix and match the new garments in the rest of my wardrobe as well! This challenge was brilliant in getting me to think about my one forlorn dress and my entire wardrobe. Thanks, Elizabeth! 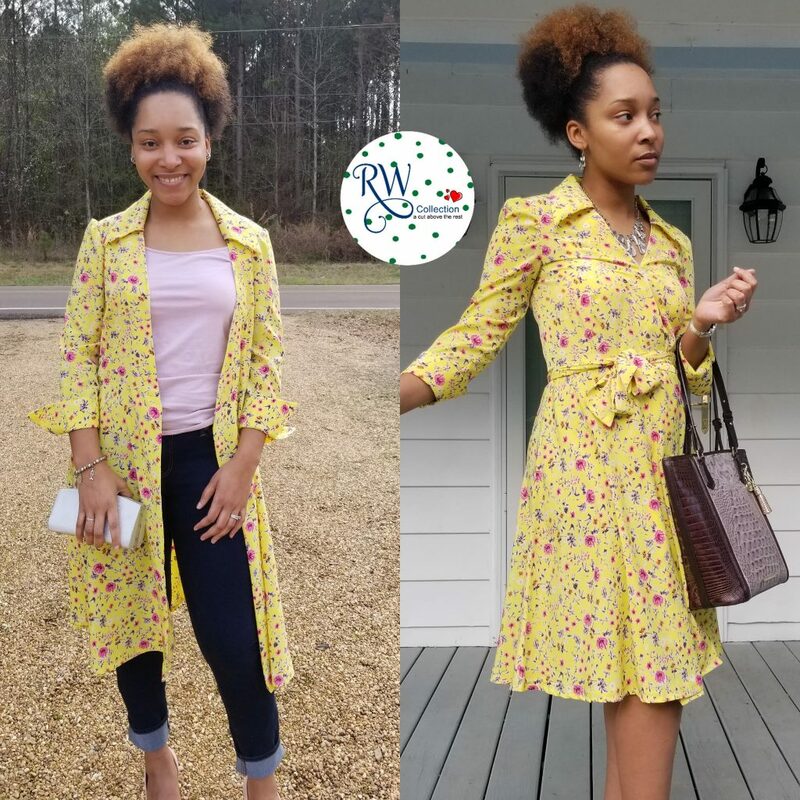 While you’re here, be sure to check out Karina’s airy refashion and pattern hack and Elizabeth’s deep dive into color.